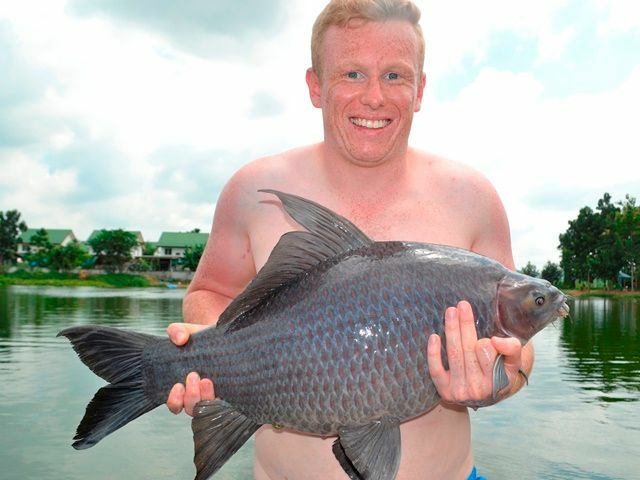 Matt was another angler who gained his BIG FISH Club membership during the month with an awesome 165lb Siamese carp. 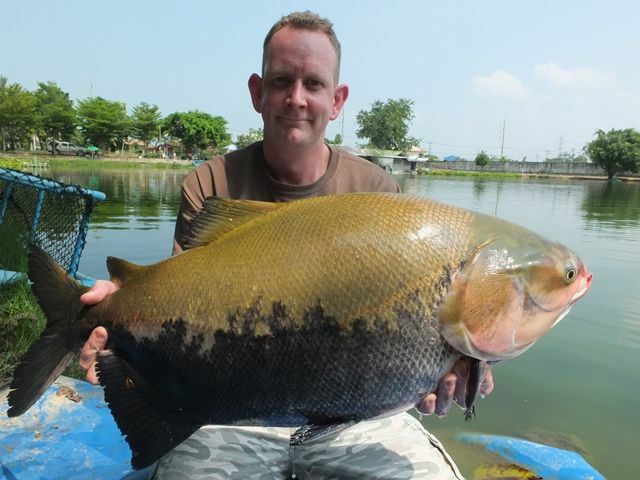 Other stunning fish included a 54kg wallago attu, arapaima, tambaqui, his first Juliens golden price carp, black ear catfish and catla carp were also new species for him. 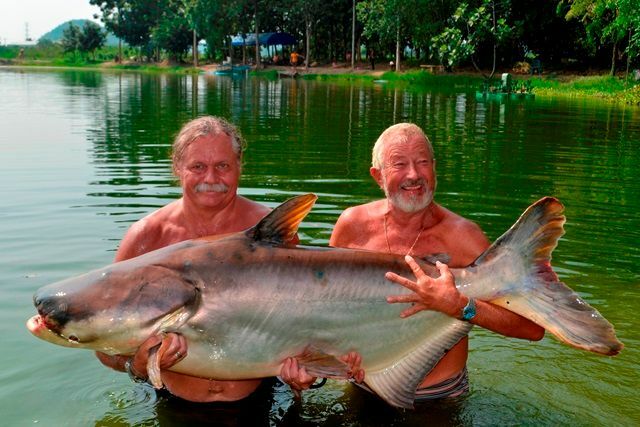 In addition he caught wallago attu, catfish shark, striped catfish, big-Y catfish, Mekong catfish, rohu and numerous Amazon and Asian redtailed catfish. Lee caught a number of new species during his session at Palm Tree that was topped off by an awesome Salween rita catfish. Other new species he caught included colossal wallago leeri, black ear catfish, stingray, albino striped catfish and mollycot. 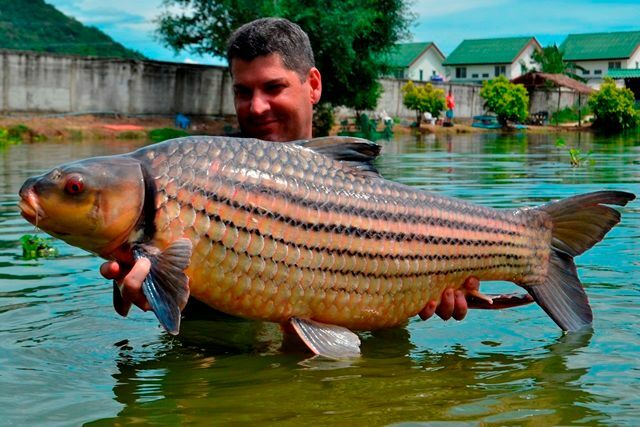 He had a number of other fantastic catches such as a pb 100lb+ Siamese carp, a lot of big Mekong catfish, a pb pacu, arapaima, catfish shark, striped catfish, big-Y catfish and heaps of Amazon and Asian redtailed catfish. 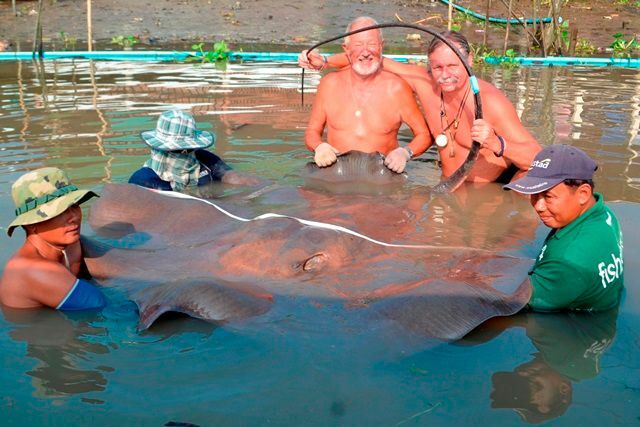 The legendary John Wilson had never caught a Giant Freshwater Stingray that is at least not until he accompanied Tim for a day on the Mae Klong River. 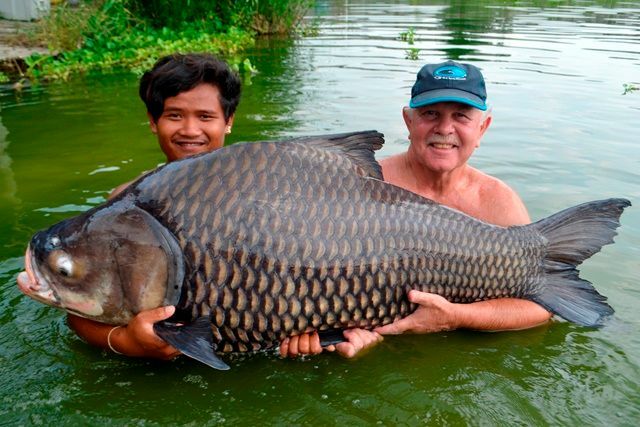 Where not only did he catch his first one but at 420lb it was his biggest freshwater fish to date and at 72 that's quite something given the number of years he has been fishing for big fish all around the world. 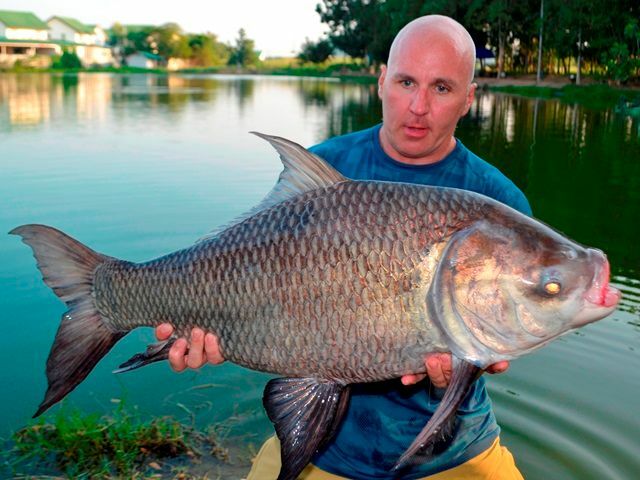 Tim was back and had great success on Urban Baits Nutcracker popups catching a number of awesome Siamese carp. 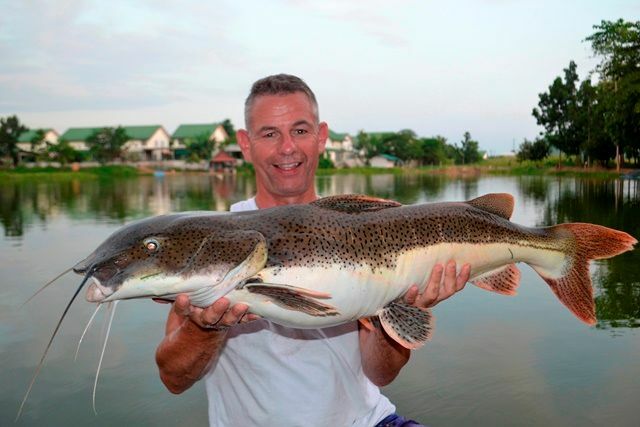 He also caught a stunning Juliens golden price carp as well as African walking catfish, rohu, marble goby, Mekong catfish a huge striped catfish.as well as both Asian and Amazon redtails. 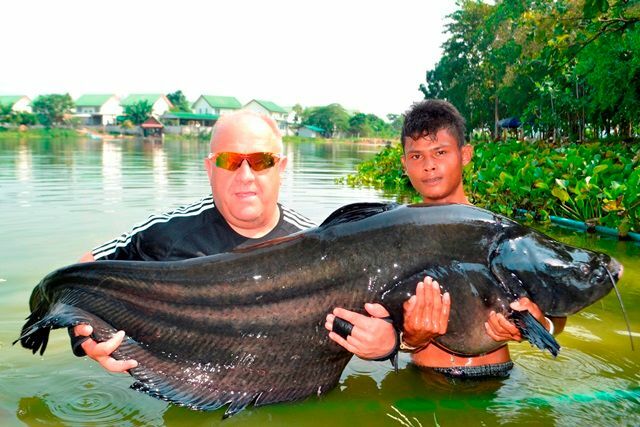 Pattaya Fishing Park brought down a couple of German customers who enjoyed there day that culminated in them joining the Palm Tree Lagoon 300lb Catfish Club with a wopping Mekong Catfish that took over two hours to land. 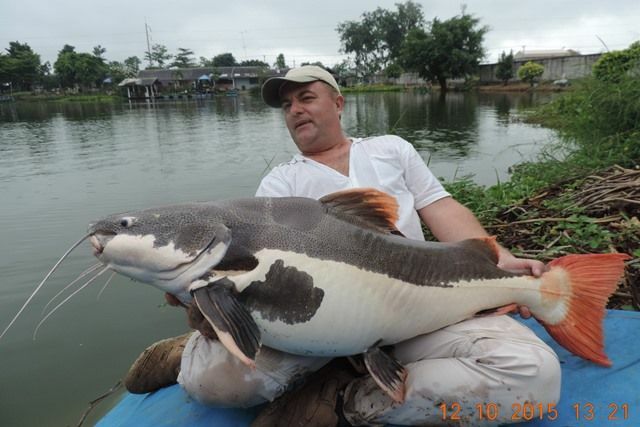 In addition they also caught Siamese carp, Mekong catfish and giant snakehead. Return Danish customer Kurt Neilsen was also back during the month relaxing on the bank with his pipe. 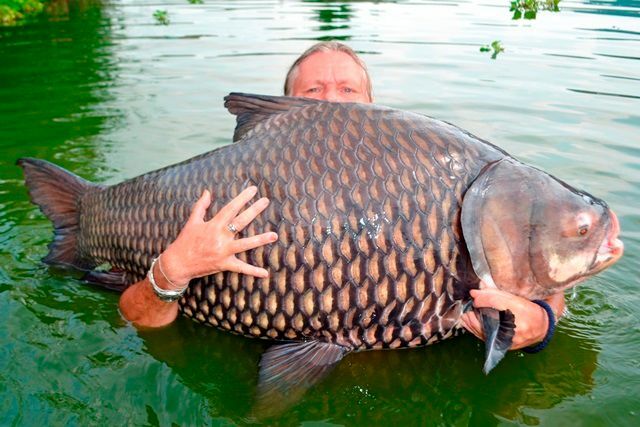 His calm demeanour paid off as he joined the Palm Tree Lagoon 150lb Carp Club landing a monstrous Siamese carp. 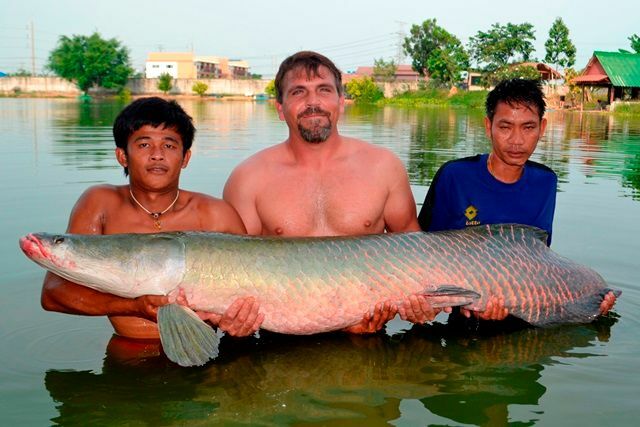 He also caught several new species for him in the shape of an arapaima, as well as tambaqui and black ear catfish. 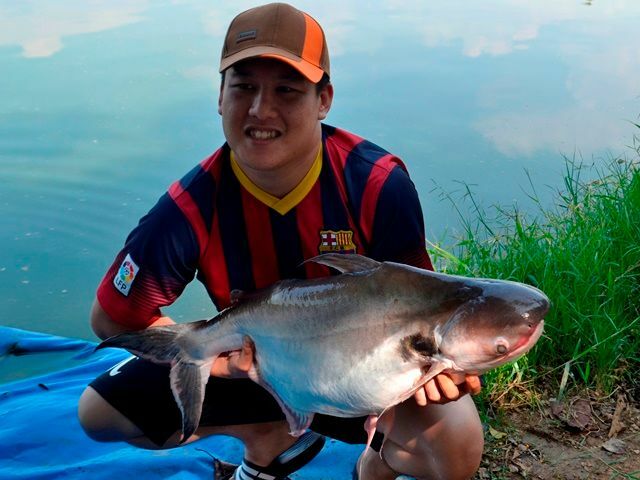 He also caught a number of other fish that included Mekong catfish and Asian redtailed catfish. Allan Oakshott, Niscus Davies and another fishing pal also made there trip during the month. 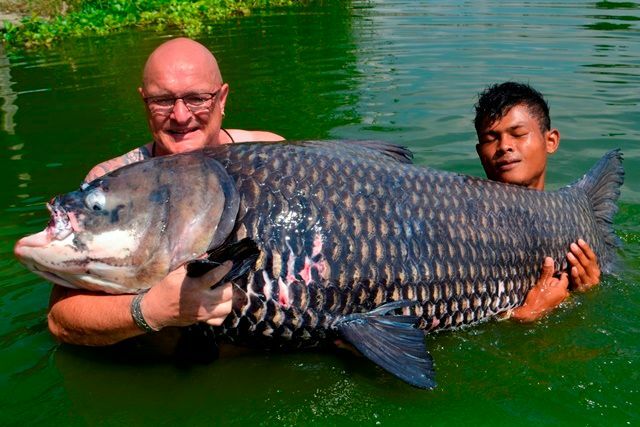 They caught a myriad of different species topped off with a stunning Chinese bighead carp, Other fish they caught included wallago attu, tambaqui, pacu, lots of big Mekong catfish, big-Y catfish, Siamese carp, and both Amazon and Thai redtailed catfish. Chris Kennedy and his wife were all smiles during their vist to Palm Tree. They caught a huge variety of fish that included a good sized alligator gar, a stunning soldier river barb and an awesome Jiuliens golden price carp.THey also caught Siamese carp, Mekong catfish, striped catfish, a superb mollycot, catfsih shark, chao phraya, and a large number of both Amazon and Thai redtails. The legendary John Wilson returned during the month with his brother Dave. 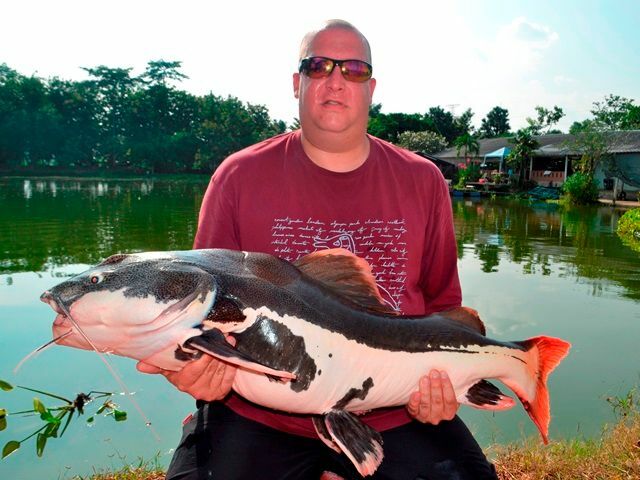 John caught a pb Mekong catfish along with a big-Y catfish a new species for him. Dave caught a pb Amazon redtail and they also caught a number of Siamese carp. Irek returned for his annual vist to Palm Tree with a new group of enthusiastic Polish anglers. 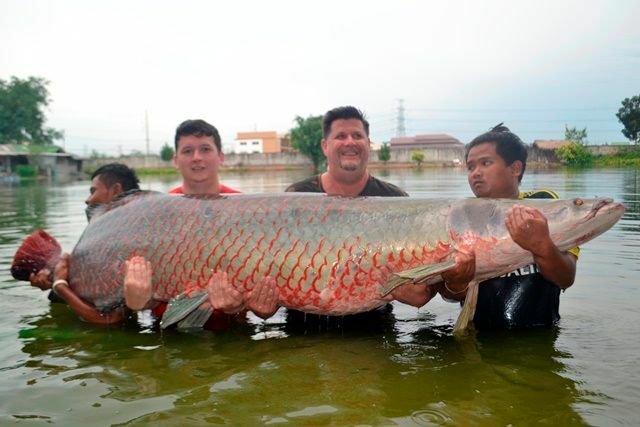 They caught a large variety of fish between them that included arapaima, some stunning Mekong catfish, Siamese carp, some huge Amazon and Asian redtails, striped catfish, wallago attu and catfish shark. Irek promised to be back again next year with another group. 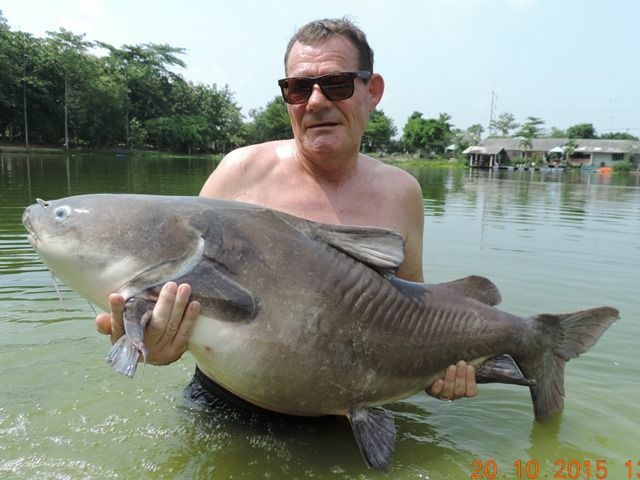 Regular Barry Gregory was back catching some very impressive Siamese carp and Juliens golden price carp, as well as rohu and Amazon redtailed catfish. Benny caught a number of awesome Juliens golden price carp during the month. 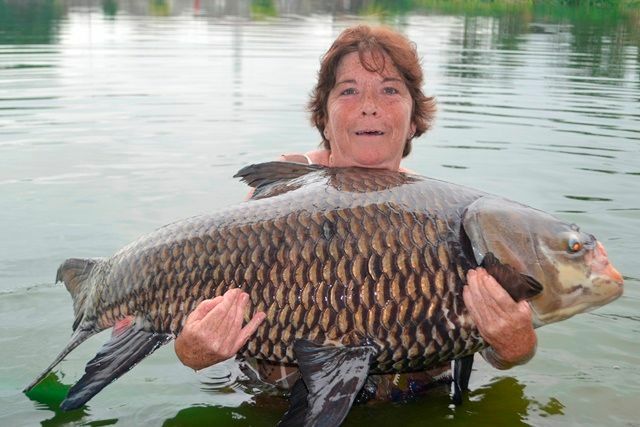 First timers Meryl Hocevar and her husband certainly enjoyed their visit to Palm Tree catching some nice fish that included Siamese carp, arapaima, giant featherback, tambaqui, big-Y catfish, wallago attu and Asian redtailed catfish. The ever cheerful Roy Redhead made a brief return visit catching an awesome leopard catfish as well as good sized Siamese carp and Amazon redtails. 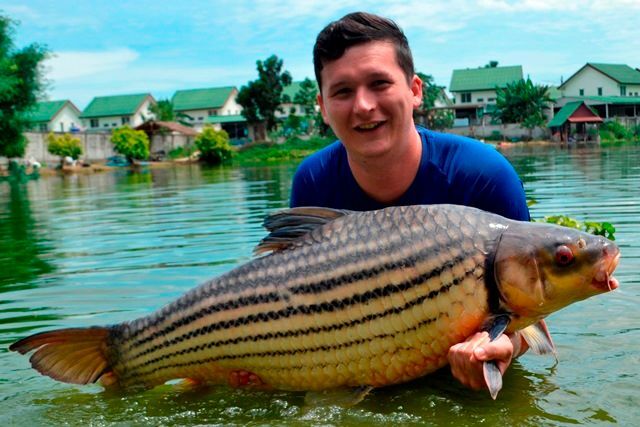 Brendon Fothergill on his first fishing trip to Thailand was also into some good fish this month catching a stunning black shark minnow as well as Juliens golden price carp, Siamese carp, big-Y catfish, Mekong catfish and Amazon redtail. 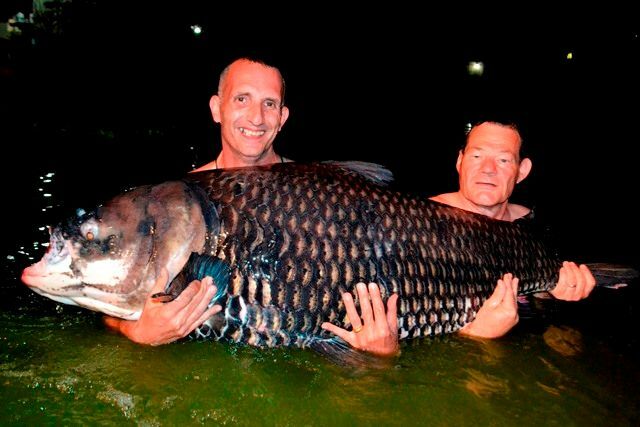 Neil Hobson was another angler making his début at Palm Tree and vowed to be back soon after catching arapaima, Siamese carp, alligator gar and Thai redtailed catfishl. 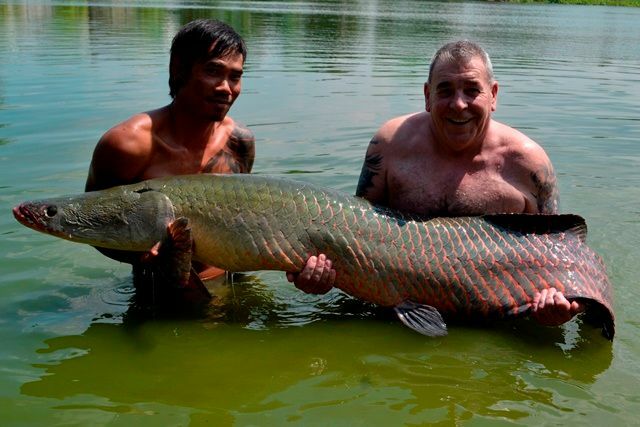 Plathong (Pattaya Fishing Guide) returned with a couple of customer having an enjoyable time catching some huge Amazon redtails as well as Thai redtailed catfish and arapaima. 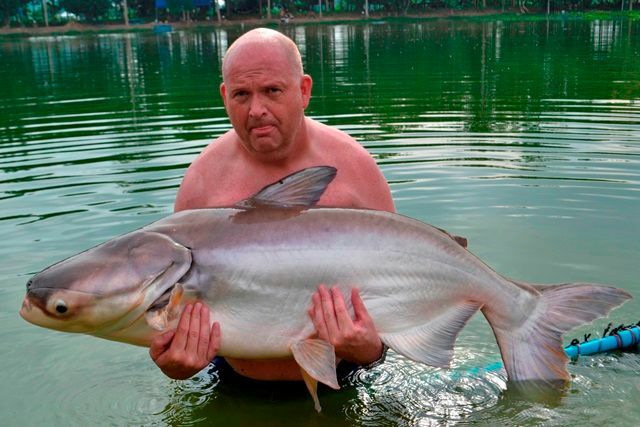 Anthony Norton was back with his fishing mate from the UK who was having his first fishing experience in Thailand. He was thou roughly thrilled catching an arapaima as well as a Mekong catfish along with Anthony catching a tambaqui a new species for him. 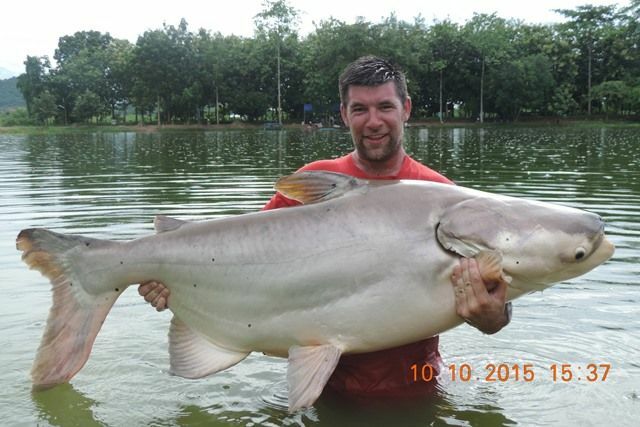 Tap of Bangkok Fishing Guide Service made his first visit for the month with his return customer Revindran who as usual was all smiles catching a very fat mekong catfish as well as Siamese carp and a strikingly coloured tambaqui. 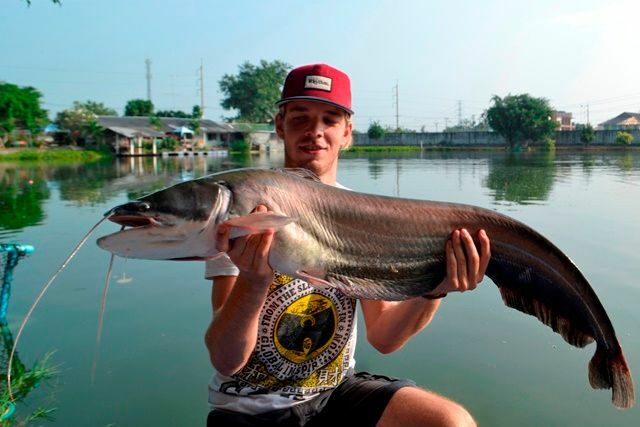 Another first timer to Palm Tree made a successful trip up from Pattaya catching some good sized Siamese carp and Mekong catfish as well as tambaqui, albino striped catfish, and a number of both Amazon and Asian redtailed catfish. Neil Yates made his first visit on the recommendation of Anthony Norton and caught some chunky Amazon redtails as well as striped catfish and catfish shark. He said he will definitely be back for a longer visit next time. 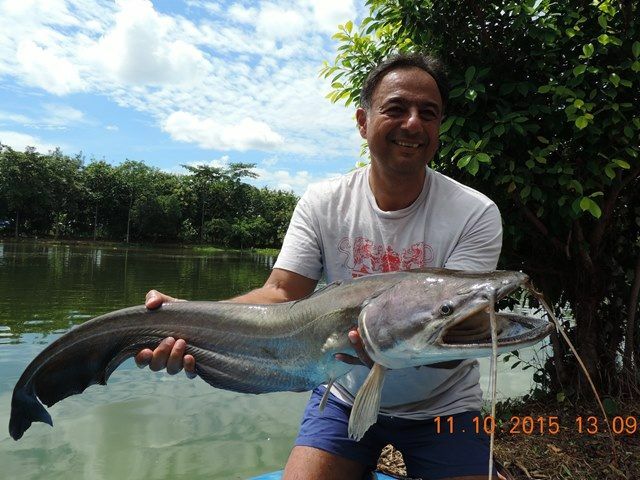 Emad Salib and his fishing buddy returned after a long absence catching some great Mekong catfish as well as Siamese carp and wallago attu. Darren Kennett successfully caught a nice big-Y catfish as well as a good sized alligator gar that proved to difficult to handle and a tambaqui. Pattaya Fishing Park came down for their second visit of the month and brought down Trent Lilly for his first visit and he caught his target fish an arapaima as well as Amazon redtails and striped catfish. 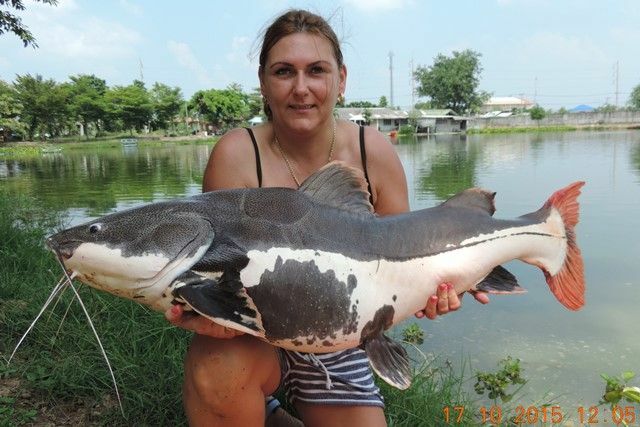 Tap (Bangkok Fishing Guide Service) made his second visit for the month with his customers catching Mekong catfish, rohu and black ear catfish. 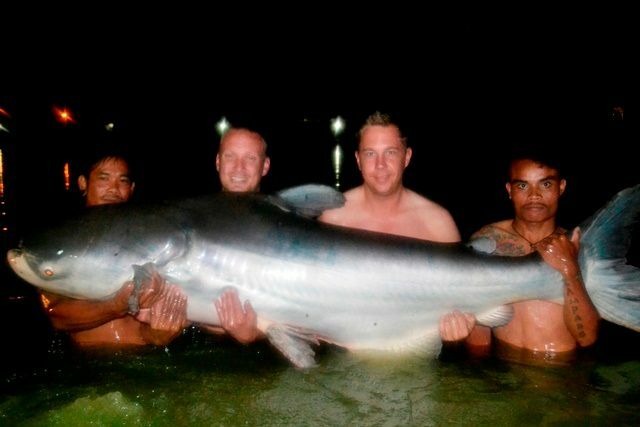 A couple of French lads dropped in on the way past and although the fishing was hard did manage to catch striped catfish, catfish shark and a wallago attu.